Fee includes: pre-workshop online materials, course materials, light breakfast, lunch, refreshments, & snacks. $350 - inquire with CPD@mghihp.edu for discount code. Spaces limited. *Student Rate applies to individuals currently enrolled in a full-time, pre-licensure, degree-granting program at the time of the workshop. It does not apply to part-time students. Student status verification may be requested. Please inquire with CPD@mghihp.edu if you are a practitioner who is not looking to claim continuing education credit for this workshop. 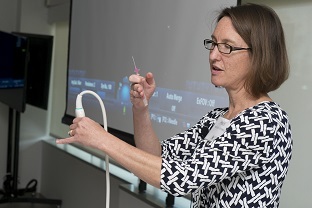 Advanced practice providers will learn point-of-care ultrasound techniques through lectures and hands-on, case-based scanning on live models in facilitated small groups during this one-day workshop, building from beginner to intermediate skill level. 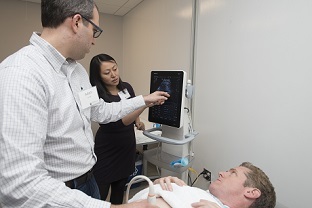 Participants will achieve a basic understanding of the application of point-of-care ultrasound, a cutting-edge diagnostic tool, in ambulatory and hospital settings. Describe the indications for and practice performing the following point-of-care ultrasound topics: focused cardiac, lung, abdomen/pelvis, deep vein thrombosis (DVT), aorta, soft tissue, ultrasound guided IV, and two of four elective procedures - lumbar puncture, arthrocentesis, nerve blocks, and abscess drainage. Apply knowledge of basic ultrasound physics and knobology as it relates to image acquisition and interpretation. Integrate the findings in the clinical patient cases. Hana Dubsky has been a BWH Emergency Medicine Physician Associate since 2005, completing the BWH EM PA Point-of-Care Ultrasound Training provided by world-recognized POCUS faculty and fellows. She will soon be taking on her new role as EM PA Ultrasound Director. Hana received a Critical Ultrasound provider certificate by Winfocus in 2009 and has served as faculty at Mass College of Pharmacy and Health Sciences Physician Assistant studies. She also received CAQ in Emergency Medicine in 2012 and has contributed chapters in the published Emergency Medicine CAQ Review for Physician Assistants. Plus, ultrasound faculty expertise from physicians and advanced practice providers from the Partners Healthcare System. This program will be reviewed as a repeating activity for 2019. In 2018, this program was reviewed and approved for a maximum of 12.00 hours of AAPA Category 1 CME credit by the Physician Assistant Review Panel. Physician assistants should claim only those hours actually spent participating in the CME activity. This program has been planned in accordance with AAPA’s CME Standards for Live Programs and for Commercial Support of Live Programs. Norman Knight Nursing Center for Clinical & Professional Development at Massachusetts General Hospital is an approved provider by the Ohio Nurses Association an accredited approver of continuing nursing education by the American Nurses Credentialing Center's Commission on Accreditation. (OBN-001-91) (OH-239, 10/1/2020). There will be a room block available at the following hotel, a 3-minute walk to the location of the workshop. Details to come. Full refund, less administration fee of 12% if cancellation received prior to October 11, 2019. To cancel, send your cancellation request to the Office of Continuing and Professional Development (IHP CPD). Refunds will be processed based on the original form of payment and will be processed within 30 days of receipt of the cancellation notice. Cancellations received after October 11, 2019 will not be eligible for a refund. Cancellation of event: In the very unlikely event that IHP CPD cancels or postpones an activity due to circumstances beyond its control, IHP CPD's liability will be limited to refund of paid registration fees. Disclosure of any and all relevant financial relationships of course directors or faculty to course content will be provided in the course materials. A number of ultrasound machines will be provided by an in-kind sponsor, Mindray.